Ancient Egypt has attracted and inspired many scholars, writers, musicians, artists and, in the recent past, online casino game software developers. Playson have chosen to use one of the mystical kingdoms ever to have existed in the world; Kingdom of the Sun. The great Egypt was a modern civilization that occupied North Eastern Africa along the Nile River and extended its territory to the New Kingdom when it conquered Nubia and the Near East. The Nile River was not only the source of water to the Ancient Egyptians but also, the source and symbol of life. They always depended on it for surplus food production which enabled the civilizations to develop socially and numerically. In fact, it was the ancient Egyptian civilization that invented new quarrying and surveying techniques which helped them to construct temples, obelisks as well as discoveries in medicine and agriculture production. This modern video slot with five reels, three rows, and 15 betways will thrill you with the many chances it offers to collect the hidden treasures. Playson has used advanced cutting edge technology to ensure that this slot is playable across different platforms including mobiles, tablets, and desktops. Kingdom of the Sun Golden Age slot is designed with top-notch graphics and animations matching the ones used in the famous Legend of Cleopatra. Upon loading, you will see the reels and symbols of favorite ancient Egypt tools and animals. There are two substantial purple columns alongside the reels and golden coins scattered on the floor. The background of the slot is designed with superb animations and a great view of the Pyramids and palms trees. The large symbols are placed on the reels, created with stunning graphics and vibrant colors that add life to the video slot. You will find the control panel at the bottom of the reels which will enable you to adjust the game bet and to view the paytable. As aforementioned, the Kingdom of the Sun Golden Age slot is played on five reels and three rows and offers 15 fixed possible ways to win. Players can choose to bet from as low as $0.15 to a maximum of $105 per line. Click on the blue up and down arrows below the gaming screen to set the bet to your preference. 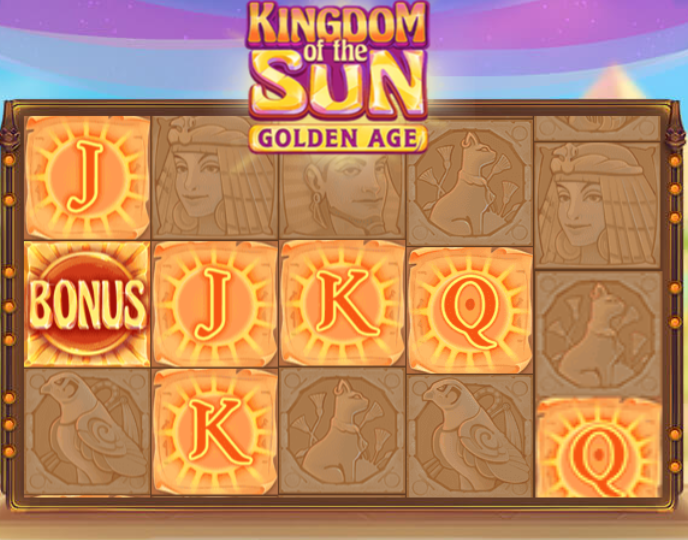 Like other online video slots, the objective in Kingdom of the Sun Golden Age is to make a winning combination of symbols on the reels. The game also has an Autoplay feature which enables the reels to spin automatically but can be stopped at any time. The settings icon in the bottom right corner allows the game to be played in the ' Quick-Spin' mode and the Max bet that allows you to play the highest bet amount. The Kingdom of the Sun Golden Age has a theoretical return to player RTP of 95.29% and allows winning combinations from left to right across all the 15 fixed pay lines. The bonus features and symbols used in the game are meant to win several generous rewards as well as increase the gaming experience. The symbols are categorized as top paying, mid paying, and low paying. The lowest paying symbols are represented by the letter J, Q, K and A which offers a maximum of $525 for five of a kind. The medium paying symbols are marked by the Hound, a Cobra Snake and the Golden Bird which offers a maximum payout of $700, $770, and $840 respectively for landing five of a kind. The highest paying symbols are Cleopatra which can pay up to $1225 and the Pharaoh which rewards up to $1400. The WILD symbol of the game substitutes all other symbols and can offer up to 5x your bet amount. Landing a Bonus symbol will activate the Spreading bonus feature. During the Spread bonus game, the Bonus symbol will remain in their place. Also, all the adjacent low symbols to the Bonus symbol will be converted into bonus symbols. This bonus feature will last until the conversions are made available while the Bonus symbols transform into one of the Wild symbols and wins are paid out. This feature is activated when the glowing mid symbols appear anywhere on the reels. You will see an arrow on the symbols that randomly chooses one of the directions: up, down, left or right once the reels are have stopped spinning. Players have an opportunity of doubling their winnings with the Sun compass or Spreading Bonus features after covering the whole playing area with one a specific symbol. This can unlock the ultimate win of up to $525! Play Kingdom of the Sun Slot on the Go! The developers at Playson have proven over and over to be the leaders in releasing a fully optimized casino game. 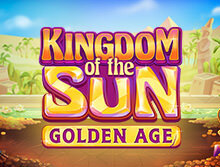 The latest Kingdom of the Sun Golden Age video slot is built with the cutting edge technology like HTML5, which makes it compatible with major mobile operating systems like Android and iOS. Also, the game is available in instant play mode, meaning you can play it directly from your mobile browsers such as Safari, Chrome, Opera and Firefox without the need to download software. Playson is a Maltese online casino software developing company founded in 2012. It specializes in providing premium solutions to both brick and mortar and land-based casinos. The developer offers all their games both in Flash and HTML5 versions, which enables them to be playable across different platforms. Their slot games are characterized with stunning graphics, great visual animations, and perfect soundtracks. They are responsible for other favorite classic video slots games like Bumper Crop, Wild Hunter and Alice in Wonder. Travel back in time with Playson's newly released video slot game; Kingdom of the Sun Golden Age and enjoy great bonus offers and other game features. Even though the game has few paylines compared to other developers, you will be compensated by the generous theoretical payout percentage of 95.29% and a medium variance to boost your ways to win. Enjoy your time on the go or from the comfort of your home playing Kingdom of the Sun Golden Age classic video slot either for fun real money at any reputable casino today.